Connemara Marble 3 Bead Earrings with silver earwires. A great piece of jewellery. The oval beads me..
A Connemara Marble Rosary made in the single decade style - the name in gaelic is An Paidrín Beag (T..
A Connemara Marble Rosary Bracelet - it includes a Medal of St Patrick and also features a Celtic Cr..
Silver Celtic Earrings with Connemara Marble inlay - the Intertwining Knot symbol is a very me..
Silver Celtic Earrings with Connemara Marble cabochon bead - the Intertwining Knots are a very..
Silver Celtic Knot Earrings with Connemara Marble inlay - the Intertwining Knots are a very me..
Silver Claddagh Brooch with Connemara Marble Heart - the Claddagh originated here in Galway in the l..
A pair of Silver Shamrock Earrings with Connemara Marble inlay - the Shamrock harks back..
Silver Tara Brooch with Connemara Marble Heart - the Tara Brooch is an ancient piece of jewellery wh..
Silver Teardrop Earrings with Connemara Marble inlay - a beautiful design with classic lines. 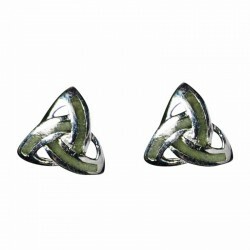 ..
Silver Trinity Earrings with Connemara Marble inlay - the Trinity symbol is a very evocative s..
Connemara Marble Claddagh Rings, Pendants and Earrings are given as a token of Love or F|riendship. It is often called the Lucky Stone and is given as a luck token. The green stone comes from near Galway and is a favourite in the shop.